Alfred Watkins (1855–1935) originated the idea of ley-lines and surveyed alignments which articulated the prehistoric landscape of Britain, in his native Herefordshire in the 1920s. Despite the scepticism of academic archaeologists, his vision of ley-lines helped shape popular views of British landscape in the interwar years, and, during a revival of Watkins’s work from 1969, practices and perceptions of British land art. According to Michael Auping, Hamish Fulton (fig.4) was not only aware of Watkins but made a study of his work. This paper will explore the way the ley-line idea is shaped by Watkins’s photographic theory and practice, a popularising one which was part of a broader survey movement in topographical representation which emphasised access to landscape and its history for an educated public.8 Watkins’s books were issued at a high point of public interest in the archaeology of landscape with reports of spectacular finds by British expeditions in the Middle East (Arthur Evans’s discovery of Minoan civilisation in Crete, excavations at Ur in Mesopotamia by Leonard Woolley and Howard Carter’s dramatic discovery of Tutankhamun’s tomb) as well as discoveries at home such as excavations at Maiden Castle and the revelation of prehistoric earthworks in aerial photographs, hitherto hidden patterns of the past which inspired a young generation of modernist English landscape artists. I will consider the politics as well as poetics of Watkins’s field of vision, how it revealed some boundary disputes in the terrain of antiquarian enquiry. In photography, as with food, Watkins went from local to national attention. 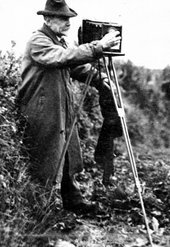 He founded the Herefordshire Photographic Society in 1895, one of many such local societies. Elected a member of the Royal Photographic Society, he became a fellow in 1910 and that year was awarded their Progress Medal for his researches into photographic theory and practice, a number of which were published by its journal. Watkins patented various affordable light meters which, as much as cheap cameras, made photography a mass pursuit. These were developed in a workshop adjoining the flour mills, the Meter Works (which also made other measuring devices for sale including calibrated metals rules and dough meters for domestic and trade baking).10 The highly successful Bee light meter was produced in Birmingham by R. Field, foremost manufacturers of range finders for surveyors and the military.11 Priced initially in 1892 at 2s 6d, about the cost of a Gillette Safety Razor, it sold in its thousands for nearly fifty years to both amateur and professional photographers, with US dials for those using Kodak cameras. It was famously used by Herbert Ponting in his iconic polar photographs of the Scott’s 1910 Antarctic expedition published in The Great White South (1921). From the 1890s Watkins issued popular manuals (successfully competing with those of camera manufacturer Ilford) which publicised his own devices and in 1911 published the first of many editions of Photography: Its Principles and Applications. Is it the schoolboy snapping his sisters or schoolmates with the Brownie bought yesterday; or the astronomer wishing to make star records? The traveller, seeking records of the people, customs, architecture, and landscape beauties of the country through which he passes, that he embody them in a book or lecture; or the experimenter dipping into the records of early investigators, and eager to be in touch with even small discoveries? The title Early British Trackways placed the book in the popular genre of ‘highways and byways’ topography, focused on a variety of old roads, from green lanes and ridge-ways to Roman roads.19 In contrast to what he called the ‘misty appreciation’ and ‘vague ideas’ of much of this writing, Watkins offered a clear, measured view, grounded in careful fieldwork of the ‘geometric aspect of topography, a framework for new knowledge’. 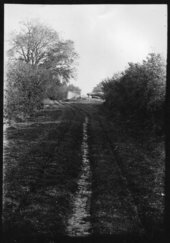 Watkins’s British trackways were not like those in a book such as Edward Thomas’s Icknield Way, winding ways folded into the landscape, the product of the tread of generations of men and animals (a trope that goes back to picturesque theory generated in eighteenth-century Herefordshire); rather they were direct, expressly commercial, routes, surveyed and planned. Watkins was reluctant to call his thesis a theory, as if that was a conjectural view, rather it was a matter of fact, or rather of logical inference from material facts, a sorting out of previously unrelated and unnoticed information ‘embedded’ in the mind and on the ground (this included local sayings and place name as well as sites) which Watkins called the orderly unwinding of a previously tangled string. Thus a longstanding antiquarian puzzle, the ‘meaning of mounds’, would be solved not so much by cutting them open, and peering inside, but by looking over the landscape and seeing their form, like that of mark stones, replicated in the shape of hills in the distance. Herefordshire’s encircling hills, including the Malverns, Black Mountains and Radnor Forest, which on a clear day foreshorten to the naked eye, are a defining feature of the ley system, producing a topography with a pronounced sky-line aesthetic. Further sightings along ley-lines would connect a range of sites and artefacts in a newly revealed field of vision, with a clear optic of spatial and social order. The facts, according to Watkins, were that an otherwise inchoate assemblage of sites (including moats, mounds, standing stones, churches, wayside crosses, holy wells, legendary trees, cuttings, Roman roads and ancient bridleways) throughout the region, running up to sixty miles, were systematically connected as a network of alignments, so called ley-lines. These were sighting lines, originally from primary, hill-top observations points and the basis for modifying the landscape to articulate alignments by constructing cuttings, embankments and causeways, building megaliths, planting trees and making ponds. Far from being the piecemeal product of the tread of generations, ley-lines were precision engineered by a powerful caste of expert surveyors. Walking, or any form of locomotion, was secondary to a system of sight lines. This network was organized by a Neolithic people apparently ‘with few or no enclosures’, as a fundamental form of social organisation, ‘for commerce and assemblies of the people’, later ‘when troublesome times came’ for defence and permanent settlements and ‘objects of superstition and genuine veneration’. The grid of ley-lines came to Watkins, he tells his readers, as a ‘rush of revelations’ on 30 June 1921, when on a visit to Blackwardine, a sighting from a hilltop led him to see on a map, before he saw it on the ground, a straight line linking various ancient sites. The map was probably the new Popular Edition of the Inch to One Mile Ordnance Survey Map which, on the front cover, had Ellis Martin’s famous figure of the cyclist in Norfolk jacket, tweed cap and plus fours, looking over the landscape unfolded on his map from one hill to that in the distance (fig.5). Watkins followed up his revelation with further map-assisted hill sightings, ‘unhampered by other theories’, and found it ‘yielding astounding results in all districts’. The theory could be verified, through what may seem a somewhat circular form of reasoning, ‘on an inch to a mile ordnance map with the aid of a straight edge’. By sticking a steel pin on ‘an undoubted sighting point’ placing the straight edge against it and moving it around until several (not less than four) sites (including place names) came exactly into line (fig.6). Travelling along the line would reveal further sites not marked on maps, such as woodland glades, trenches, fragments of causeways and above all, otherwise unnoticed notches on the crest of hills. The alignment of the Four Stones and Castle Tomen forms the cover illustration, and frontispiece for Early British Trackways (fig.7). This takes the form of a collage, with three photographs of the sites, one a telephoto shot of Castle Tomen, superimposed on a woodland glade marking a ley. Watkins had used collage for the cover of Hereford, Herefordshire and the Wye, pinning a photograph of Hereford cathedral on a scene in a hop garden, but here assembles a composite landscape. This combined some conventional techniques of popular landscape photography, riming foreground stones and distant hills and splicing a focused background shot onto a foreground one, with the older conventions of topographical print series, running views as a journey sequence. 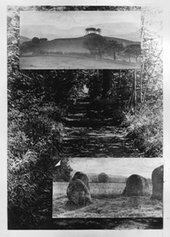 There are affiliations with arts and crafts landscape photography by Frederick Evans, highly structured views, uncluttered by modern incident, articulated by rising paths to the horizon.21 There are twenty plates in Early British Trackways, some with multiple views. As if to emphasise that the ley system literally overlooked picturesque sites like castles, the focal point of a view of Brampton Bryan Castle (complete with Victorian garden) is at the very margin of the photograph, the summit of Coxall Knoll. One plate has three vertical strips from separate telephotographs showing sighting cuttings in hill summits. Two plates are of reworked Ordnance Survey maps, one cut up into strips (in the style of old road maps) showing the course of leys. While Watkins favoured the coloured, folding Popular Edition as the ‘working scale’ for use in the field, he used the larger uncoloured sheets on four drawing boards for plotting lines, along with other instruments for ley mapping, T squares, divided quadrants and glass pins used by photographers. The landscape of ley-lines draws on various strains of progressive sensibility. Ley-lines articulate a free trade utopia, enabled by an enlightened planning regime, looking back and forward to a liberal landscape without landlordism.24 The pre-enclosure vision, cutting across established propertied interests, recalls the imaginative geography of John Bunyan’s The Pilgrim’s Progress, where the narrow path to the light is ‘straight as a rule can make it’. Watkins’s ‘rush of revelations’ on that June day in 1921 came in a summer of ‘clear, smoke-free distances’, a clarity caused by coal stoppages which encouraged progressives at that time to envision another system of power, the national grid of electricity.25 In contrast to the prevailing scholarly view of a culture of isolated settlements in forest clearings, Early British Trackways offers a model of ancient Britain as an organised, unified, mobile and expansive society. This activates the heritage of the Herefordshire border country as the ancient British kingdom of Siluria, which under Caractacus had resisted Roman dominion, a mythology mobilised in contemporary views of the British Empire.26 While Watkins’s views are aligned to the pressure for public access to the landscape, one codified by the civilian initiative of the Ordnance Survey to publish its Popular Edition, the military imperatives of reconaissance, for an enthusiastic fundraiser and recruiter for the late war, are evident too. The prehistoric caste of ley-line surveyors made their sightings according to Watkins ‘in much the same way as a marksman gets the back and fore sights of his rifle in line with the target’. Despite, or perhaps because of the scepticism of fellow members of the Woolhope Club, and some criticism in newspaper reviews, Watkins undertook an intense period of study to substantiate and develop his theory. Over the next three years he conducted further map-work and excursions, with his assistant, W.M. McKaig, who also supervised the meter works and did much of the drawing for the books, and continued to combine business transactions with field work. Watkins was no walker along ley-lines, at least for any distance (he once broke his ankle pacing directly up a steep hill); he favoured motor cars of various kinds, both steam and petrol powered vehicles, to get close to the key sites, to carry his camera and his assistant Mr McKaig, and to establish the scope of the system.27 Watkins read widely in a range of related literature, including topographical works, regional geographies, illustrated magazines, place name studies, folklore, and literature, from Shakespeare to Robert Louis Stevenson. Many scraps of evidence are brought in to support the theory, some from sympathetic correspondents, some apparently ad hoc including observing a girl fording a pond and the reports of a local drainage board. Poorly schooled, (his father had him work his way up the firm from being a delivery boy), this amounted for Watkins (in his sixties) to a form of self education. The result was a 235-page book The Old Straight Track, with 129 illustrations, published by Methuen in 1925, when Watkins was seventy years old. While Watkins was intent to locate the ley system in his home region, with the object of a chapter on ‘Leys in Radnor Vale’ to show how, in this ‘compact district’, old straight tracks are ‘thick on the ground’, the effect of the range of new evidence is to greatly extend the theory, both geographically, to the rest of Britain and beyond, and culturally, from a system of material, expressly commercial livelihood to one which included various forms of spiritual and even occult knowledge and, in tune with the popular movement for historical re-enactment, assumed an expressly performative element. As such it connected to sensational views of archaeological sites elsewhere, for example Sir Norman Lockyer’s work on sun alignments in Greek and Egyptian Temples and famously Stonehenge. 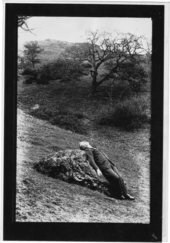 Thus the photograph of Mr McKaig lying on what is described as a sacrificial stone (fig.8) is informed by a work called ‘Sun Worship in the Malvern Hills’ by one P.H. Lestrange of the Malvern Geographical Society and echoes the restaging of a similar event in a photograph Watkins took from the National Geographic Magazine illustrating an article on Inca ritual sacrifice. Watkins extended his repertoire of views in ley collages to include sites throughout England and one of the Ghaza Desert, taken by a man on duty with the Hereford regiment in Palestine during the war. The later, literary, chapters of The Old Straight Track lose touch with local field observation in some speculative flights of word association, one tracing a line from the Welsh ‘twyt’, pronounced ‘toot’ in English, to the Tut of Tutankhamun to Tooting, south London (a nice antidote to this suburb’s reputation at the time among highbrow critics as the end of civilisation). The most hostile reception of Watkins’s theory, because it trespassed on his territory of archaeological knowledge, came in the work of O.G.S. Crawford. In 1923, in his new post as archaeology officer of the Ordnance Survey, Crawford had his own spectacular revelation of ancient landscape. Looking at some negatives of practice photographic surveys taken by military pilots over Salisbury Plain, Crawford saw faint lines of an avenue leading away from Stonehenge. The photograph was published in the Illustrated London News and the existence of the avenue confirmed by excavation later in the year.35 As well as referencing Crawford’s cartographic based work in Kent, Watkins had clearly read about the Stonehenge discovery, for he reckoned aerial photography would help substantiate ley-line theory, but Crawford was intent on repudiating it. Crawford founded Antiquity in 1927as a new kind of publication between a learned journal and the popular press to publicise serious research and scholarship, with high production values, classy typography, accessible writing and high quality illustrations, especially aerial photography. Antiquity particularly appealed to a literary and artistic audience, inspiring modern-minded artists with a taste for the primordial Britain, notably John Piper and Paul Nash.36 In the first editorial Crawford noted that archaeology was ‘emerging from the archaic stage, and we are able at last to see single facts in relation to an organic whole, the history of Man’. ‘We shall keep our readers informed about important discovered made and books published; and we shall warn them about mare’s nests. Many so called discoveries are nothing but newspaper “stunts”; many best-sellers are written by quacks. Such books are ignored by the learned world’.37 Crawford refused to accept an advert from Methuen for The Old Straight Track, now in its second edition, and exposed Watkins’s work where he could without giving him the credit of naming him. Aerial archaeology was valued precisely for its modern, moneyed glamour, carrying the subject away from the control of old men like Watkins, the very figure of the antiquarian. Crawford was in his thirties, Piggott early twenties, as were Piper and Nash. Crawford was financially supported in civilian archaeology by Alexander Keiller (also in his thirties) who enjoyed a substantial private income from the family marmalade business. Their jointly authored Wessex from the Air (1928) is much more conscious of the heritage of archaeology than anything in Watkins’s works. One photograph of the Stonehenge Avenue (fig.10) also reveals in the form of a large white spot, surrounded by a darker band, a round barrow opened by the eighteenth-century Wiltshire field antiquarian, Sir Richard Colt Hoare; it is as much about the archaeology of archaeology, and its role in regional identity, as about that of the landscape itself.38 Despite Watkins’s hopes that it would confirm the ley system, aerial photography, in its planar style, flattening relief, offered a contrasting optic to the hill top, skyline views which envisioned the ley system. Perhaps the most vivid commentary on Watkins’s vision is in M.R. James’s ghost story A View from a Hill. First published in 1925, it is one of a series of ghost stories by this master of the genre concerned with archaeological research, with haunting and often horrific events produced by misplaced curiosity and overzealous investigation.39 James’s principal career was as an antiquarian scholar and college administrator at Kings College, Cambridge and Eton, working on what he called ‘Christian archaeology’, library scholarship on books and manuscripts, notably on the apocryphal books of the Bible, rather than field work. He published for a popular as well as academic readership. 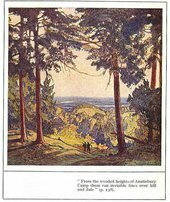 As well as A View from a Hill, in 1925 he also published the handsomely illustrated guide book Abbeys for the Great Western Railway. The work for this took James into Herefordshire and involved site visits and collecting information from existing guides and articles in local history journals. A View from a Hill concerns Fanshawe, a ‘man of academic pursuits’ from Cambridge or Oxford, tired of college and committee meetings, at the outset of the long vacation staying with a new friend, a squire living ‘in the depths of the country’. On the evening of his arrival he and his host take a walk up a hill which dominates the area. The squire points out various archaeological sites, old earthworks and a Roman villa, identified by one Baxter, an old watchmaker in the village who was also ‘a great antiquary’ and who died fifteen years ago. The squire tells his guest that Baxter would shut up his shop for days at a time to ‘wander off over the district, marking down places, where he scented anything, on his ordnance map’. To the consternation of the man servant, they take a pair of unusually heavy binoculars which Baxter made himself. The squire points out various landmarks to be seen from the summit of the hill, notably a ruined abbey and clump of trees on neighbouring Gallows Hill. Through Baxter’s binoculars Fanshawe sees into the past, the abbey complete and a scene of hanging on Gallows Hill. After a nightmarish sleep in which he sensed ‘something had been let out which ought not to have been let out’, Fanshawe spends a morning perusing the transactions of the County Archaeological Society with many articles by Baxter on most eras of archaeology prehistoric, Roman and Christian, ‘written in an odd, pompous, half-educated style’, and in the afternoon rides his bicycle to Gallows Hill, an evidently haunted place whose spirits try to ensnare him. Baxter’s heavy binoculars are not, we are told, like modern light field glasses but more a form of camera, with their own development process, which draws on photography’s reputation as a spectral, ghost-producing technology. To cut a short story even shorter, it turns out that Baxter had excavated the bones of executed criminals, boiled and distilled them in a liquid which he sealed in the binoculars. Looking through ‘dead men’s eyes’ destroyed Baxter, as it was the spirits of the dead men in question who killed him. 1. Alfred Watkins, The Old Straight Track, its Mounds, Beacons, Moats, Sites and Mark Stones, London 1925. 2. Originally published by Methuen & Co. Ltd., The Old Straight Track was republished as a Sago Press book by Garnstone Press, London, who also published The View Over Atlantis. I recall both books at the time, when, along with titles as various as Jeff Nuttall’s Bomb Culture and the Tibetan Book of the Dead, they formed part of the alternative paperback shelf in student flats and, around the small Scottish university town where I studied, in run down cottages where people got their heads together in the country. 4. Richard Long, In Conversation Part Two, Holland 1986, p.125. I am grateful to Joy Sleeman for this reference and the one following. 5. Michael Auping, ‘Tracking Fulton’, in Hamish Fulton, Selected Walks 1969-1989, exhibition catalogue, Buffalo 1990, p.12. 6. Nicholas Alfrey and Stephen Daniels eds., Mapping the Landscape: Essays on Art and Cartography, Nottingham 1990; Stephen Daniels and Charles Watkins, The Picturesque Landscape: Visions of Georgian Herefordshire, Nottingham 1994. 7. David Dimbleby, with essays by David Blayney Brown, Richard Humphreys, Christine Riding, A Picture of Britain, London 2005. On representations of the past see Brian Leigh Molyneaux ed., The Cultural Life of Images: Visual Representation in Archaeology, London 2000; Sam Smiles and Stephanie Moser eds., Envisioning the Past: Archaeology and the Image, Oxford 2005 (an abbreviated version of a chapter in this book is available online in Tate Papers, Sam Smiles, ‘Thomas Guest and Paul Nash in Wiltshire: Two Episodes in the Artistic Approach to British Antiquity’. 8. On photographic survey see Elizabeth Edwards, ‘Commemorating a National Past: The National Photographic Record Association, 1897–1910’, Journal of Victorian Culture vol.10, no.1, 2005, pp.123–31. On survey and educated access more generally see David Matless, Landscape and Englishness, London 1998. 9. Ron Shoesmith, Alfred Watkins, A Herefordshire Man, Little Logaston Woonton Almeley, Herefordshire 1990. 11. ‘Notes on the Industrial Side of Photography in Birmingham’, The Photogram, vol.77, no.77, May 1900, notes. My thanks to Pete James for this reference. 12. Alfred Watkins, Photography, its Principles and Applications, London 1911, pp.v, 1, 17, 32, 321–5, 264–79. 14. Chapman, Hereford, Herefordshire and the Wye, Hereford 1882, pp.45, 47, 76. On ink photos see Geoffrey Wakeman, Victorian Book Illustration: The Technical Revolution, Newton Abbott, 1973, pp.142–3. On the picturesque in Herefordshire see Daniels and Watkins, 1994 and Stephen Daniels, Charles Watkins and Susanne Seymour, ‘Border Country: The Politics of the Picturesque in the Middle Wye Valley’, in Christiana Payne, Michael Rosenthal and Scott Wilcox eds., Prospects for the Nation: Recent Essays in British Landscape 1750–1880, London and New Haven 1997, pp.157–82. 15. Alfred Watkins, ‘A Summer Among the Dovecotes’, English Illustrated Magazine,1892, pp. 45–53. On Gere and New see Simon Houfe, The Dictionary of British Book Illustrators and Caricaturists 1800–1914, London, 1978, pp.315, 399. 17. Report on Autumn Meeting, Paper on ‘Early British Trackways, Moats, Mounds, Camps, and Sites’ by Alfred Watkins FRPS, Transactions of the Woolhope Naturalists Field Club, 1921, pp.32–4. 18. Alfred Watkins, Early British Trackways, Moats, Mounds, Camps, and Sites Hereford, 1922. 19. Adam Stout, Choosing a Past: The Politics of Prehistory in Pre-War Britain, unpublished PhD thesis, University of Wales, Lampeter 2004, pp.191–3. 21. 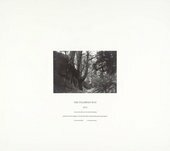 Ian Jeffrey, Photography, A Concise History, London 1981, pp.102–4; Anne Hammon, ‘The Soul of Architecture’, in Anne Hammond ed., Frederick H. Evans: Selected Texts and Bibliography, Oxford 1992, pp.1–33; Clive Scott, Frederick Evans: ‘Photography as Mediation’, Journal of European Studies, vol.30, no.1, pp.35-56. 22. Nigel Pennick and Paul Devereux, Lines on the Landscape: Leys and other Linear Enigmas, London1989. L.V. Grinsell, ‘Alfred Watkins and The Old Straight Track’, Transactions of the Woolhope Club, vol. XLVI, 1988–90, pp.76–81. 23. Crawford, Man and His Past, Oxford 1921, especially chapters 14 and 15. 24. On the civil vision of free trade see Frank Trentmann, ‘National Identity and Consumer Politics: Free Trade and Tariff Reform’, in Donald Winch and Patrick O’Brien eds., The Political Economy of British Historical Experience, 1688–1914, Oxford 2002, pp.215–44. 25. Bill Luckin, Questions of Power: Electricty and Environment in Inter-war Britain, Manchester 1990, p.17. 26. Daniels, Seymour and Watkins, 1997. 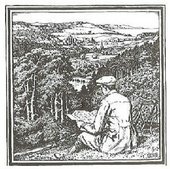 Tim Barringer, ‘Music and Vision: Landscape, History and Empire in Elgar’s Caractacus’, paper given at AHRC framework seminar ‘Land, Air and Water’, University of Nottingham, 2 July 2006. 30. Allen Watkins, Alfred Watkins of Hereford, London1972, p.30. 31. Alfred Watkins News Cuttings, Herefordshire Archives, M90/2. 33. Michael Ffinch, Donald Maxwell, Kendal 1995, pp.175-6, 201–5. 34. Donald Maxwell, A Detective in Surrey: Landscape Clues to Invisible Roads, London 1932. 35. Kitty Hauser, ‘Fertile Images’, in Melanie Keen and Eileen Daley eds., Necessary Journeys, London 2005, pp.34–7. 36. Kitty Hauser, ‘Photography and the Archaeological Imagination: Britain c.1927–1951’, D.Phil thesis, University of Oxford 2003, pp.116–60. 37. ditorial Notes, Antiquity, vol.1, no.1, 1927, pp.1–4. 38. Crawford and Alexander Keiller, Wessex from the Air, Oxford 1928, p. 222. 39. First published in The London Mercury, May 1925 pp.17–30. The Herefordshire setting was identified by James in the preface to his Collected Ghost Stories and the Watkins connection first noted in Rosemary and Darroll Parodoe, ‘The Herefordshire of a “A View from a Hill”’, The Ghosts and Scholars M.R. James Newsletter, Issue 6, September 2004. Earlier versions of this paper were given at a Tate Research Seminar, Tate Britain, 15 May 2006, a conference on ‘The Cultural Reception of Prehistoric Monuments’, University of Bristol 6 April 2006, and co-presented with Charles Watkins, to a session on ‘Spectro-geographies’ at the annual conference of the Royal Geographical Society 31 August 2005. I particularly wish to thank the following for comments: Nick Alfrey, Elizabeth Edwards, Kitty Hauser, Richard Humphreys, David Matless, Joy Sleeman and Adam Stout. Stephen Daniels is Professor of Cultural Geography at the University of Nottingham and Director of the AHRC Programme in Landscape and Environment. 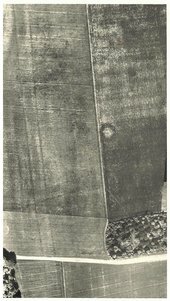 Stephen Daniels, ‘Lines of Sight: Alfred Watkins, Photography and Topography in Early Twentieth-Century Britain’, in Tate Papers, no.6, Autumn 2006, https://www.tate.org.uk/research/publications/tate-papers/06/lines-of-sight-alfred-watkins-photography-and-topography-in-early-twentieth-century-britain, accessed 24 April 2019.